Imagine a Butler Basketball game without the War Song, or even without the nagging, collective “whoosh” yells — see first 15 seconds — every opponent is subject to during free throws. This is music either involves a pep band or only the hoarse screams of students. The camaraderie between hundreds or thousands of instruments, vocal or otherwise, stirs a cathartic effect deep inside us. Our earbud cords are IV tubes to lifeblood. College kids feed off music, eating it up together like they do lunch in the dining hall. This is why Phi Delt’s obnoxious speakers turn heads across campus on Friday afternoons; playing “Closing Time” every time dusk settles in has become the oldest joke on Hampton Drive. This also explains how Post Malone’s repetitive new single “Rockstar” became a hit: it’s a party favorite, not lyric genius. It’s why our sneakers pound treadmills harder when the HRC blasts Britney Spears’ “Work B—-”, and why late-night BUPD creeps up on a lively senior house that’s forgotten to shut a window. How are these situations related? It’s a craving for sensory overload, collective memories all in sync. Scientific subtleties are at play, but few people actually understand any of that. What we “get” is the internal response to an outward stimulus. Each of us rides a beat, and the waves are hitting us at the same moment. Every August, American students are drop-kicked out of their home nests into one comprised of a population exactly their own age. How bizarre, an idyllic little community of adolescents teetering on the edge of “the nice part” of Indianapolis. To ward off feelings of isolation, our awkward wings fly us about in an effort to make friends. The dorm-unit flock appears at PlayFair, where overstimulated SOGs blare the Top 40 and force the fledglings into the embarrassment nicknamed orientation. We barely hear each other over the noise, but the music helps. Because everyone knows the songs, we bop along lamely and relax. Our collective spine tingles, it is spongy cartilage pulsing in collegiate unison. In a more “refined” manner, the same happens in the belly of Clowes Hall, which is full with the orchestral pit’s rich, heavy sounds. This time, though, the 1200-odd patrons of the theatre are barely breathing; it’s silent. The violinist’s bow has sprinkled goosebumps over every seat. Stray tears leak from a few eyes. In a different way, college students enraptured by this setting are experiencing a connectivity, maybe in a more soulful sense. Call to mind your favorite restaurant. It’s likely that the atmosphere is complementary of the food. A dainty filet mignon pairs perfectly with a Beethoven sonata, or, more realistically, your greasy fries match Burgerfuel’s laid-back Red Hot Chili Peppers vibe. Eating is often considered a group activity; it’s made more enjoyable with company. Music helps us unwind and bond in this scenario, as well. Milestone moments witnessed in group atmospheres are bolstered by traditional music, like “Pomp and Circumstance” during a graduation procession, or “Here Comes the Bride” at weddings. Some music’s fame or ceremonial connotation lends more of a monumental importance to well-attended events such as these. Music weaves the brainwaves of our community together tightly, and we experience emotional connections on a wide spectrum. Humdrum, mundane activities are supplemented by sound. How odd that in today’s world, something that can’t be seen or watched is so powerful. 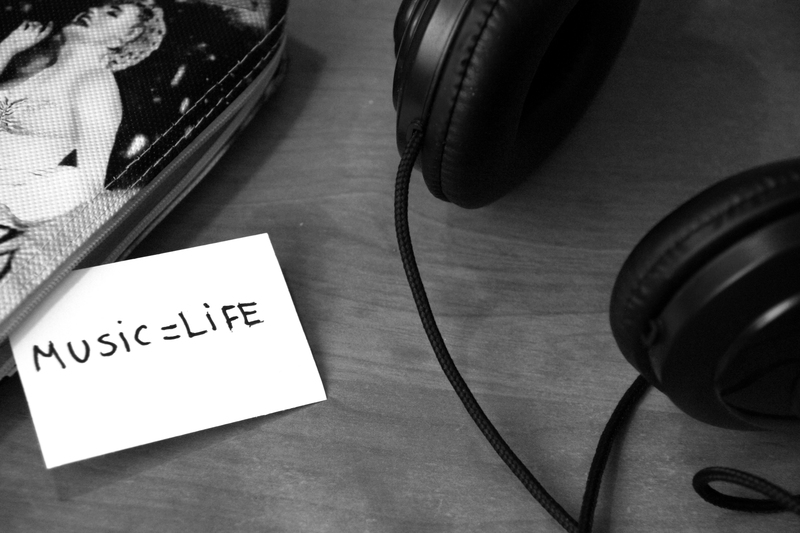 Music brings a vital kick of flavor to our collective, collegiate adventure.